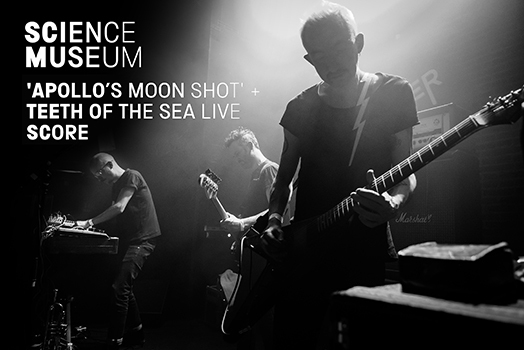 We are delighted to reveal that Teeth of the Sea are to Live Score the 'Apollo Moon Shot' Film at the Science Museum's IMAX Theatre in London on the 21st June. 'Join us for a unique preview of Smithsonian Channel's new series 'Apollo’s Moon Shot' with a live score from Teeth of the Sea. 'Apollo’s Moon Shot' looks back on one of the most important leaps forward in human history, exploring the journey from America’s first manned orbit to the last man on the Moon. The six-part series premieres on 17 June on the recently launched Smithsonian Channel UK and airs weekly throughout June and July. We will be screening an abridged feature-length cut of the documentary series, with a live score performed by London psychedelic rockers Teeth of the Sea and introduced by famed American aviator Mary Wallace “Wally” Funk.